Important circular from the UAE Ministry of Education regarding EmSAT guidelines. ensure that students understand clearly what is expected of them and what they may expect from administrative and teaching staff. Sixth Form students are asked to read and sign a ‘Home School Agreement’. It summarises the expectations which we have of our sixth form students and their behaviour whilst also defining staff obligations for dealing with Sixth Form students. In addition new students must read and sign the school’s official Academic and Behaviour Policy. Sixth Form students are expected to be good role models for younger students, providing inspiration and guidance. They should support the ethos of the school and support the school staff. Edexcel and CIE examination boards are followed, dependent on subject chosen. Sixth Form students have their own social area in which to relax during breaks, the common room. It is equipped with comfortable seats, study tables and a small kitchen area with a fridge and microwave. At AAESS we understand the need for sixth form students to have a quiet study area. A study room for the exclusive use by sixth formers is available. This room also has a number of PC’s for the students use, and has a library of worldwide university prospectuses which the students can access. In addition sixth form students are encouraged to use the newly introduced supervised study room. Sixth Formers are also allowed to use the cafeteria at any time throughout the school day. Each member of the Sixth Form develops and maintains a close relationship with a Form Tutor who has contact with each student on a day to day basis. As well as this constant support, the Head of Sixth Form is available to help and support students with personal or academic matters. This ‘Open Door’ policy is maintained in all aspects of Sixth Form life. Sixth Form Students are urged to take an active role in the Student Representative Council. This sets a good example for the younger students and promotes leadership qualities for the sixth form student. Each year a Head Boy and Head Girl are elected by the Head of Sixth Form, Sixth Form tutors and school management. The Head Boy and Head Girl are natural leaders who support the students, management and staff at AAESS. They are involved in many fundraising activities, such as the Annual Charity Football Day, non-uniform days and bake sales. This is an excellent award for Sixth Form students to receive as it promotes leadership qualities and communication skills. Sixth Form students are appointed as prefects and are responsible for a particular form group. As a prefect they are responsible for accompanying their form class to assembly, assisting during PSHE lessons and monitoring the school grounds during break. They also support the Head Boy and Head Girl with their fundraising activities. Sixth Form students are actively involved in the compilation of the School Magazine and Year Book. They form the backbone of the editorial team guiding other students along the way. In addition, many sporting and artistic opportunities are available throughout the academic year. Applications to British Universities and Colleges are made through UCAS, which is a Clearing House system where an on-line service allows an application for up to five universities. 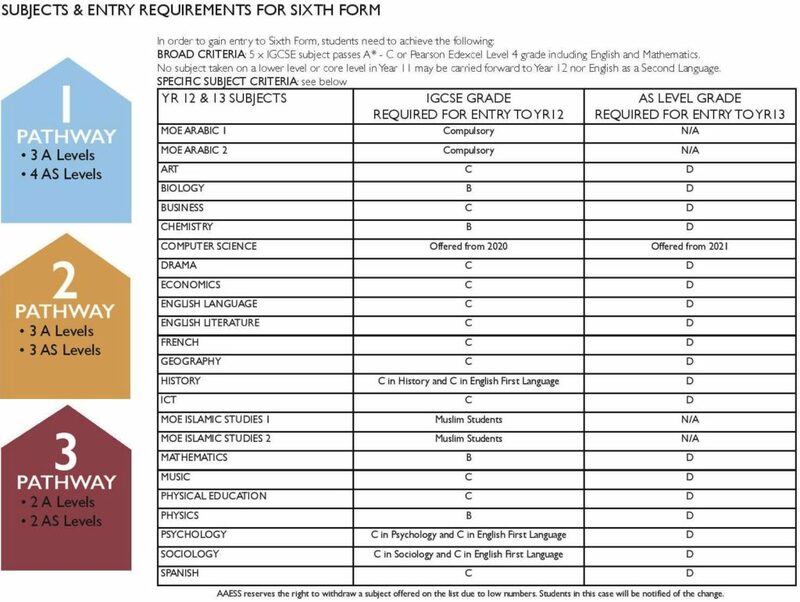 The process starts at the in Year 12, with completed applications being dispatched in December- January of the following year. Applications to Oxbridge, medicine, dentistry, and veterinary sciences are sent in slightly earlier. All AAESS candidates are registered for UCAS by the school and should not register individually. For students considering the USA, Canada, Australia, European and South African applications are made directly to the individual university during the final year. Some American institutions have a common application form, but most need an individual one. SATs scores are required by all North American universities and in addition a TOEFL qualification may be needed by most Canadian institutions and American universities if the applicant does not hold current US citizenship or is not a native English speaker. Students intending to further their studies in the UAE are also offered advice and support on their application process. Advice on which course and which university comes from the Head of Sixth Form and subject staff in general. The Head of Sixth Form runs a designated University Club for sixth formers one day a week after school to offer guidance and support throughout the application cycle.